This snake can't be charmed! 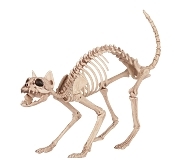 Scare your trick or treaters with this rearing cobra skeleton, hood flared and ready to strike! Created from molded plastic and detailed to look like an ancient fossilized cobra. This serpent prop is a great piece to make your Halloween decor extra spooky. Measures approximately 39'' x 4''.